As some of you will know the reason I’ve not posted for a while is that my Mum had been poorly, and she has recently passed. She unfortunately suffered from dementia in the last couple of years of her life, and as anyone who has been through this knows you feel you’ve lost the person you love before they’ve gone. 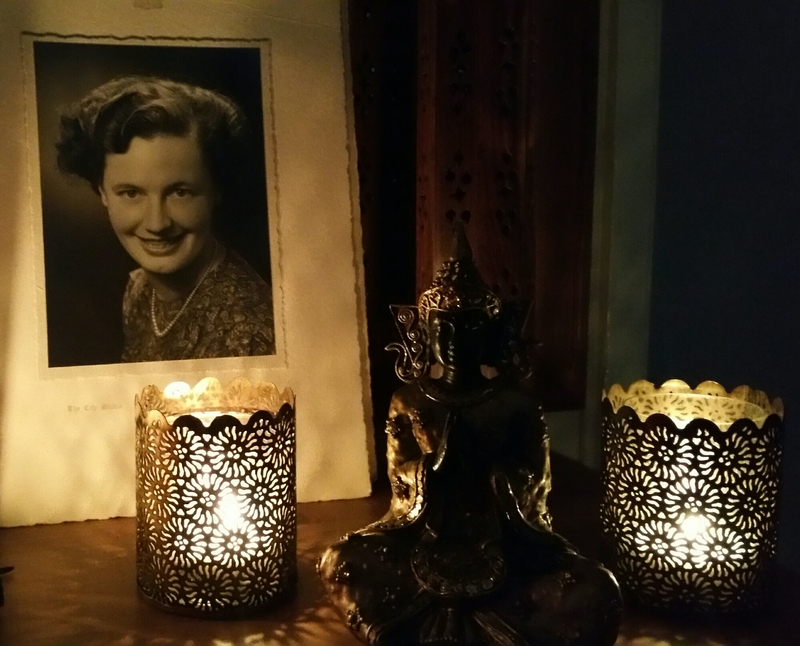 I found this so hard, but tonight I have sat quietly, lit candles and drifted through memories of her long and happy life, both those I share and those I will never know. I feel she has been here with me, helping me to remember the person I love, and it has given me so much peace. So I ask you to indulge me…. I remember seeing this picture of Mum when I was a child, and wondering that she was ever this young, glamorous girl. We so often don’t think of our parents as people, having lives and loves and stories that started long before us. I’m fortunate that Mum shared some of her story, such as starting work in the London Stock Exchange when she left school, and working there for over 25 years, becoming a Gilt Edged Securities Clerk, managing three girls under her and literally processing millions of pounds. Or her travels to Kenya as a single woman in the 1950’s, visiting her dashing older brother, a pilot first in the RAF then privately after the war. I will never forget her very matter of factly telling me how she had hidden in the back of a car for hours from hostile attack during the Mau-mau uprising, very much my Mum, always understated! There are some lovely b/w shots somewhere of her holidaying in Jersey before she met Dad, and I would love to have known this beautiful, bright career woman. The Mum I knew had such warmth, kindness, generosity and love. She had stopped working, but she never stopped moving. Cooking, baking, sewing, knitting, embroidery, card making… A truly creative and talented lady. Just from my recall in Randwick where we grew up she volunteered at school doing reading and crafts, helped run and was treasurer of the playgroup, became Brown Owl for the Brownies, and was an active member and fundraiser for the Mothers Union and the Women’s Institute – all while raising two slightly lively(!) girls. In later years she moved to Great Bedwyn, became President of the WI for a time and was a massive support to The Bedwyns Link Scheme, an active village voluntary scheme providing cross community support locally to all who needed it for over 15 years. Wiltshire Life presented her with a well deserved Carer of the Year award for this tireless work. The sheer number of cards we have received, sharing memories of her and mourning her loss have been an amazing testament to the hearts she touched along the way. Nearly all of them mentioned her smile, which to the last could light up a room. Mum I will miss you more than words can say. You truly were an inspiration. I learned from watching you how to be fair, how important it was to be caring and generous with others. Through my adult life you have been a gentle constant presence, never judging, just loving and welcoming as always. I’ve probably taken that for granted sometimes, but you have been like a light in the window that has always been there to welcome me home and make me feel loved. I want you to know how much I love you. It’s that simple, and that huge and that magical. That bond is something that time and the universe can never break. Always, your loving daughter, Denise.